How did I start metal detecting? Dave Sadler, editor of the magazine 'Archaeology and Metal Detecting", tells us how he started out in metal detecting. Dave Sadler is the editor of the Magazine "Archaeology and Metal Detecting" a successful magazine that was launched in March 2016. Dave was bitten by the detecting bug when as a 4 year old boy, he would go on many detecting trips with his Dad and Uncle. Here is his story. How did I start metal detecting? That’s a question I’ve had to consider and look back at. 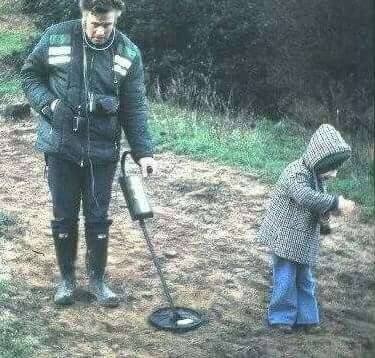 In the 1970’s as the image included attests, my dad – my hero, and my uncle both acquired metal detectors, visiting the beaches of North Wales and Anglesey and fields local to the area I grew up in Cheshire. As Families, we all were involved having picnics and snake hunting. But for a 4 year old this new thing was mesmerising. My uncle claims still to this day, that one of my early words, which I repeated constantly was Archaeology. So my years growing up and having to visit historical locations, metal detect and play scrabble! Probably pointed me in the direction of Archaeology and Metal detecting. When my dad passed away, his early C.Scope 600 was passed to me, at a time that I wasn’t really into having a hobby; it was left in my cupboard for many years. Forward to the early 2000s. I was lucky to have a friend who knew a man who ran an archaeological group and acquired us an invite onto new dig. Wow, what an experience, I was actually practising what I always wanted to. I learnt a hell of a lot in a very short time, and inadvertently found a Roman road surface and a possible ‘Lost’ holy well. My friend was also a member of the West Kirby Metal detecting club. He was able to kit me out with a used machine and my adventure began. As well as surveying the archaeological sites we were privy to via the archaeological group and he also had an agreement with the Gwynedd Archaeological Trust to Survey a site on Anglesey in North Wales. Throughout this period I also utilised my dad’s early C.Scope 600. We were able to discover many items on all sites which added to the historical story of each location. Some of which were put on show in Lllangollen museum in North Wales. Unfortunately at this point, several things in life occurred which made me unable to participate in my hobbies, and I sold my used machine and lost my Dads C.Scope whilst moving home. Life continued to get in the way until 2013. Via another group in a different subject, I met the landlord of my local pub. Graham was a metal detectorist, and with his pal Dave, generally sat at the end of the bar sorting finds. And again I was engrossed. I kept asking Graham to form a group, and received a surprise on my 40th Birthday of a brand new machine. Off I went to Graham and a brief conversation was had and Tempus Metal detecting and Archaeology group was formed. My initial idea to cover both subjects and help bridge the gap between them. I had a great few years, discovering many artefacts, upgrading machines, making new friends and organising charity events. Again life intervened and from a period of depression, I found my therapy swinging my coil. But my mind was not occupied and I wanted to do more. On March 1s 2016 the Archaeology and Metal Detecting magazine was launched, and something very dear to me was created. I have made a lot of friends and met a lot of people via the subject, I have been privy to some amazing artefacts being discovered and myself found items of consequence. Life and health have again intervened, but although I am sometimes unable to be actively involved, my Dad, my uncle, an old C.Scope 600 and a lot of luck have given me a future filled with possibilities within the historical world. So long windily… That is why I metal detect.